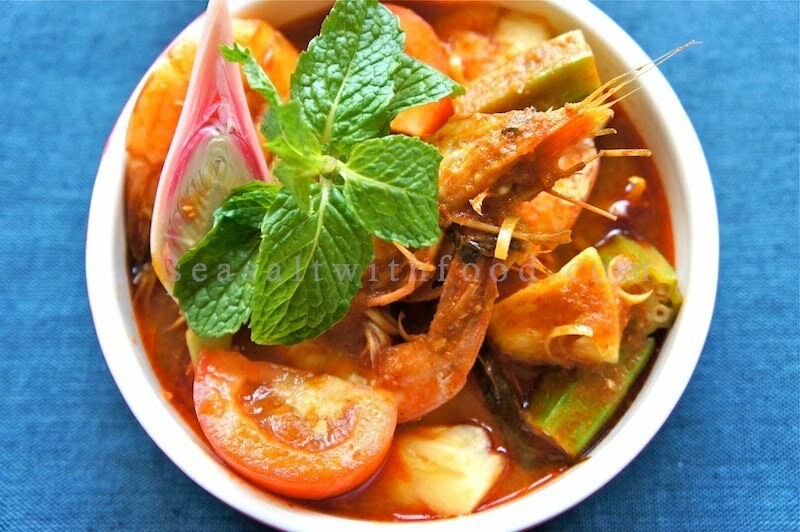 Assam Prawns is one of my family’s favorite assam dishes. Great when enjoyed with just some steamed rice. One of the key ingredients in this mouth-watering dish is the fresh “bunga kantan” or torch ginger flower. Unfortunately, whenever I cook this dish in Vancouver, I had to substitute it with frozen or dried torch ginger flowers instead as it’s not available over there. I took the opportunity to cook-up this Assam Prawns using fresh torch ginger flowers which are available everywhere here in Kuala Lumpur. Simply fantastic! Finely grind the spice paste ingredients with a little water in a blender or food processor. Then add the torch ginger and polygonum leaves. Cook the mixture for about 4-5 minutes. Turn the heat on high and mix in the tamarind water and sugar. Bring it to a boil and let it simmer for about 20 minutes. Then add the prawns, onions, okra, tomatoes, and pineapple. Bring the mixture to a boil again and reduce the heat to simmer until the prawns and vegetables are cooked. Season the Assam prawns with sea salt and sugar, if necessary. Serve immediately with some fresh mint leaves. That looks delicious. I like the combination of okra, tomatoes, and pineapple. Just reading the ingrediants is making me drool. Lovely! Angie, thank you for sharing your assam shrimps with us! Lovely photography and styling, as always. Happy Merdeka Day to you! Take care! Haha, I just posted up assam fish! Yours look very good ... want to swope! Had an invite from Pei-Lin to join "Merdeka Day" but unfortunately am a bit late, next year then! In the meantime I am enjoying the visual feast. This looks delicious. I love the prawns in shell, they're so aesthetically pleasing. Now if I can just figure out where to find these ingredients in Reno, NV, I'll definitely give this a try! i love assam anything, especially prawns. this looks amazing! 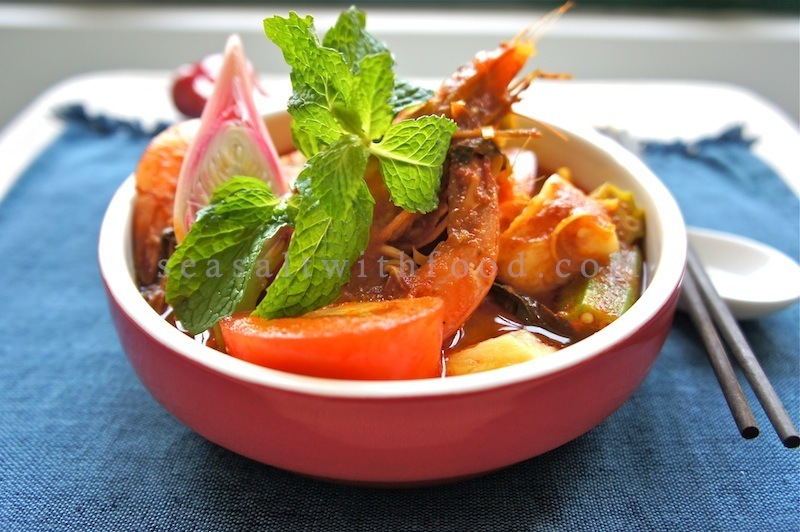 I love prawn dishes and this one looks nice and hearty ! Hi. Where did you find dried torch ginger in Vancouver? I'm afraid it's not available here.